For the Jasmine, the 4 Moncler Simone Rocha line, collection n°4 of the Moncler Genius project, returns to the perfect setting of the English countryside. 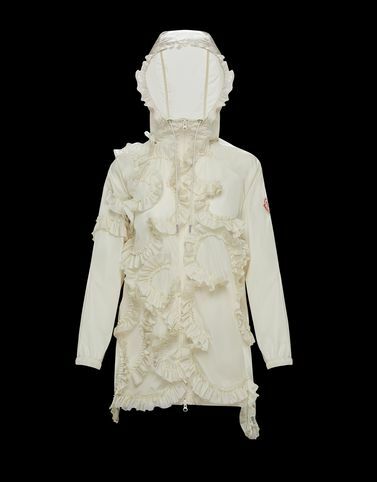 This unlined technical nylon jacket makes no secret of its inspiration, mimicking flowers and roses that seem almost fragrant, thanks to the laser cut ruffles that look like a myriad of delicate petals in flight. Wash max 30°C - Mild process; Do not bleach; Do not tumble dry; Ironing maximum temperature 110°C - without steam; Do not dry clean; Professional wet cleaning - mild process; Dry flat; Wash separately; It is advisable to wash and iron with the garment on reverse.